Cosmetic powerhouse FACE atelier is expanding their portfolio of retailers on Friday, June 22, 2018. The cruelty-free collections will be launching on QVC, with special guest Sheila West, Executive Director of Pro Education at FACE atelier. Since its inception, FACE atelier products – and particularly cult favorite Ultra Foundation – were ‘must-haves’ in the makeup kits of professional makeup artists globally. They continue to be used on the sets of today’s top TV shows, films, editorial shoots & music videos. With shout-outs from celebrities like Kelly Clarkson, there is no question about the high quality and superior performance of the entire line of cosmetics offered by the Canadian brand. FACE atelier is launching on QVC, on Friday, June 22, 2018, scheduled for 8:40 pm EST, offering their Flawless Foundation set featuring a choice of six inclusive shades of Ultra Foundation. The set also includes Liquid Powder (better known as Ultra Matte to its legions of fans) and introduces their Pro Series Stipple Foundation Brush, from the soon-to-launch cruelty-free collection of synthetic professional brushes. An early pioneer of inclusive beauty, FACE atelier founder Debbie Bondar has always been committed to offering cruelty-free products for women of all ages, skin tones and skin types. Over 99% of FACE atelier products are vegan, and the brand is both Peta and Leaping Bunny approved. 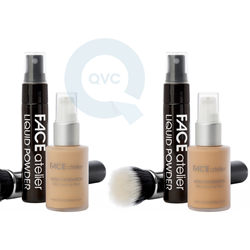 A selection of FACE atelier’s best-selling products are currently available on QVC.com and the entire range can be purchased at http://www.faceatelier.com.